Would you leave Bono alone. Sure doesn’t he pay for a musical program in Ireland. He’s trying his best. Aside from the naked (pardon the pun) Bono-bashing, what’s really the angle on this story? “Wealthy man has investments, may part-own Lithuanian shopping centre”. Bono told the world to drop the debt of developing countries so they could use money to fix their economies. He then happily engages in off shore tax evasion, a big problem for those same countries. He would do better, if he practiced what he preached and campaigned to shut down tax evasion through the activities he himself uses to avoid tax. 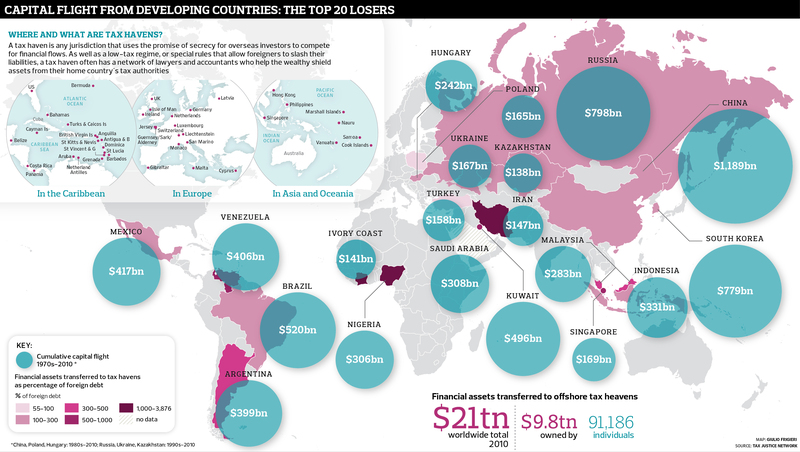 For example, Nigeria and Ivory Coast, the only two countries on the African continent with data available, show that “capital flight” from those countries runs at between 1,000 to 3,900% of their National Debt. If Bono was true to his word to stop capital flight and reduce developing country debt he would not be engaging in such activities. It’s not that he has done anything illegal, but that many are tired of his double standard rhetoric. It is perfectly normal for people – at all levels of wealth – to look for a certain degree of privacy concerning their financial affairs. 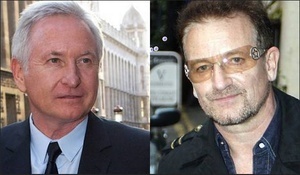 Where is the evidence that Bono evades tax in this instance? it is what the news is telling us. if this is incorrect, I will be delighted to know more, or get clarification. I’m not saying he’s doing anything illegal, just that he’s full of contradiction when he is using low tax havens that exacerbate the problem of paying off 3rd world debt which he himself says needs to be eradicated. It’s a bit of… It’s OK for me, but not you… type double standard, is it not? Bono has campaigned to drop the debt of, for example, Cameroon. Does Bono incur a signficant tax liability in Cameroon? If so, does he structure his affairs to pay as little as tax as is legally possible in Cameroon? If the answer is ‘yes’ to both questions then you have a point. If the answer is ‘no’ to either question then you don’t. I suspect it is ‘no’ because U2 have never played in Cameroon, sell no merchandise there, sell a negligible amount of CDs and get very little legitimate radio airplay either. Exactly what jurisdiction do you think he should be paying more tax in? Thank you Bertie, we’ll have that! You should look for a (small) fee Bertie. There’s nothing quite like a bit of Irish begrudgery to start the week. oh look it’s a bertie ahern fan…. Private citizen does private citizen things with private monies. I won’t be voting for him in the next election. You’ll be voting for someone who’ll allow him to avoid paying taxes! We all will! There’s nobody else credible to vote for! are youse trying to become the Daily Mail or E! something? Part of the reason for the hate for Bono is because he preaches so much about giving money to charities and big corporations are bad but it turns out he is just as bad for evading tax as all the other rich. it’s more that he sings about inequality, gets paid a shed load then hides it from the tax man thus perpetuating that inequality. He may not be breaking any rules, but that’s not the point. It’s the immorality of it. It’s very hard for ordinary joe/joan soap to get by generally. Their taxes are generally all accounted for and swallows up anything from 20-50% of their hard earned pay for which they see broken services in return being run by a paid of overpaid buffoons. This incredibly rich man, and others, are able to skew the system. Pay next to nothing, and contribute nothing to the grander social scheme. It may be illegaly but it’s morally bankrupt. + 1 And he has the gall to get on his soapbox and preach. Do as I say, not as I do. Bog off Bono. But Bono’s financial affairs are INEVITABLY going to be extremely complicated. He is not a PAYE worker! He has income from touring, album sales, merchandising, and royalties. These arise in at least a hundred jurisdictions! It is very hard for anyone to pass judgement on his tax affairs with little bits of information here and there. His tax affairs are complicated? So, to make it easier I guess, is why why he further complicates it by using offshore shell companies. He is not a PAYE worker, but he gets a very handy tax break as an “artist”. At the end of the day he’s still getting paid, someone, somewhere is ensuring that the absolute minimal is getting back to help aid essential services. Do you pay more tax than you are obliged to? ok so looking at this from another angle. I think everyone has a PAYE way of thinking possibly but in self employed world it doesn’t work as well as you might think. Lets say I’m self employed. Its 2 guys and a van scenario. I have 1x employee and both myself and Mrs Martco (who does the bookkeeping) are directors. 3 wages.The books only have a finite amount of cash. When it comes to wages and Mrs Martco & our personal tax returns it is in fact my accountant’s job is to work out given the money available in the companies books how much we can pay ourselves as efficiently as possible. I’m sorry outraged people but it just is. In a straight maths exercise I could pay myself double. but I don’t, I pay myself according to the means the company can afford naturally AND ensuring that I pay as little money as necessary out to Revenue. I could pay myself double but the books would be tight I would reduce the cash on hand and Revenue are going to need a very much larger payment from me in the return at year end which I will never ever see back…..and maybe next year I might be ill for 3 months and I still have to pay wages. Like if any of ye think it should be any other way then you need to go work for yourself and see how that goes for you. I find the moral outrage puzzling although likes of Bono is a big target, I get that. but WTF is “moral bankruptcy” anyway? Is there some measurement device available for this. Please explain. Rules are rules and I play by them. Am I in my above scenario supposed to not abide by the rules? Deliberately fupp myself and my company so I can be morally solvent? seriously? martco, in your scenario above – as long as you are within the law that is fine. Unless you are preaching to drop debt of developing countries. In that case you are a hypocrite. no doubt. sure even the other 3 of them apparently find him hard to live with when he goes on with the preachy horsesht. Exactly. You beat me to it, Cian. Whatever about Bono’s hypocrisy, the real scandal isn’t that this is illegal, but that it’s legal. Nigel – you’re right. this should be illegal; we need all countries to agree to stamp this out. Bloke can’t do anything right. His money, he can invest it how he sees fit. Inheritance tax is 33%. The present tax free limit a child can inherit is £315,000. Eventually Bono and Ali will pass away, hopefully in the far distant future. Will 33% of their wealth (after the tax free allowances are deducted) go back to Revenue?………………will it f**k! So many millions being made out of three chord tricks. It’s three chords and the TRUTH!!!! And God, don’t forget the big fella. Awaiting the new BBC comedy series “Mrs Brown Envelope’s Boys”. Just pirate this guys music if your into current U2 music, I’m not into U2 but I would pirate it if I was. While you’re at it just pirate everything and save your cash. It’s all disposable media produced by faceless multinational billionaires who don’t pay tax anyway. Wasting money on physical media financially irresponsible and before you all go blah blah vinyl sound better blah. all music is recorded digitally and transferred to analogue so it sounds the same if not worse. All the best movies and music have all ready been made. save your cash, you’ll need it come the next economic crash , and its going to be a doozy. Bono will be okay though, thanks to the sad idiot U2 superfans. If you were married would you volunarily pass up the tax break involved therein? No, because marriage and stable families is good thing for a society. Good things should be encouraged. A really dumb analogy Ro. You can do better.